Elected to eight consecutive terms as mayor of Jersey City, served thirty years from 1917 to 1947, considered one of most powerful political bosses in state and nation. Born to Irish immigrants, second of eight children, father worked as blacksmith and bank guard. Dismissed from school at age thirteen for poor attendance and bad behavior, worked briefly as blacksmith's assistant for railroad and manager of boxer until becoming as teenager Democratic political operative as a ward constable responsible for turning out voters. At age 22 elected street and water commissioner in 1911. Championed charter reform to replace mayor-council form of government with a commission form of government, which Jersey City adopted in 1913. Elected commissioner of public safety in 1916, headed police and fire departments and control of patronage in hiring and promotions. Became mayor in 1917, elected by other commissioners even though he did not receive most popular votes in election. As mayor, used political base of Irish Catholics to reward supporters with contracts and jobs, also constructed hospital, third largest in US, to provide free health care for poor and expanded social service and public works projects; fulfilled pledges to ban nightclubs and house of prostitution, maintain clean streets and restrict gambling games and lotteries to those run by churches. Ability to turn out vote in Jersey City and Hudson County created strong statewide role, influenced gubernatorial appointments of state, local judges and prosecutors and allocation of resources in state budget. Advocate for women in politics, endorsed community volunteer Mary Norton in successful 1921 campaign as first woman elected Hudson County freeholder, also supported her election to 13 consecutive terms in House of Representatives 1923-1949. In 1932, after first supporting for Democratic presidential nomination Alfred Smith, former Irish Catholic New York governor, shifted support to Franklin D. Roosevelt, organized campaign rally at which 120,000 supporters greeted Roosevelt at New Jersey governor's mansion in Sea Girt in August 1932. After Roosevelt's election, secured substantial federal funds from New Deal programs, including serving as de facto boss allocating all New Jersey jobs funded by Works Progress Administration, also aided by seniority and committee post of Congresswoman Norton. Opposed labor union efforts to organize workers due to concern it would discourage investment in industrial plants, attempt to prevent Congress for Industrial Organizations from holding public meeting and distributing pamphlets held invalid by US Supreme Court in Hague v. CIO decision in 1939, also overruled by courts in attempt to prevent Socialist Party presidential candidate Norman Thomas from campaigning in City. Despite salary between $7,500 and $8,000 as mayor, resided in 14-room apartment in Jersey City; maintained suite at Plaza Hotel in Manhattan; home at Deal on Jersey Shore; and home in Florida, as well as frequent trips to Paris. Never indicted, but widely viewed as supplementing income by $500,000 to $1 million annually from kickbacks on public jobs and contracts. Retired as mayor in middle of eighth term in June 1947 at age 72, but continued as chair of state and county Democratic parties and vice chair of the Democratic National Committee until 1949. Nephew Frank Hague Eggers named by commissioners as his successor, but Eggers lost 1949 mayoral election to former Hague ally John V. Kenny, who led slate pledge to combat corruption (but himself convicted after leaving office as mayor of corruption in 1971). After opposing adoption of new state constitution, reached compromise with Republican Governor Alfred Driscoll and Essex Republican chair Arthur Vanderbilt which led to ratification of revised charter in 1947 referendum. Died at Manhattan apartment at age 79, interred in mausoleum at Holy Name Cemetery in Jersey City. Only individual to serve as both New Jersey governor (1962-1970) and chief justice (1973-1979). In two terms as governor, expanded state services for handicapped; enacted legislation for development of Hackensack Meadowlands; increased education aid; and created state's county college system. As chief justice, presided over Supreme Court during Robinson v. Cahill case closing schools leading to enactment of state income tax in 1976; and "right-to-die" decision In re Quinlan allowing parents of Karen Ann Quinlan to remove comatose daughter from a respirator. Born to Irish American family in Florence Township on Delaware River a few miles south of Trenton. Father Richard P. Hughes a Democratic activist, at various times mayor of Burlington, state civil service commissioner and warden of Trenton State Prison, where family lived for period. Graduated from St. Joseph's College in Philadelphia and New Jersey Law School, later merged into Rutgers University. As young lawyer in Mercer County, worked for elections of Franklin D. Roosevelt, served as alternate delegate to 1948 Democratic National Convention, one of Democrats who succeeded in transforming Mercer from Republican to Democratic stronghold, elected as County Democratic chairman. Skill at forging compromises brought nickname "Two Buckets" for image of being able to carry a bucket of water on each shoulder without spilling a drop by leaning toward either side in a controversy. Appointed an assistant US Attorney for New Jersey, later named judge of Mercer County Court and state Superior Court. In 1957 promoted to Appellate Division of Superior Court, state's second-highest tribunal, but soon resigned to return to private practice to support growing family with second wife Elizabeth known as "Betty," widow he married in 1955 after first wife Miriam died in 1950 after having four children. In 1961, selected by Democratic leaders as party's gubernatorial nominee after first choice, Attorney General Grover Richman, suffered heart attack. Won upset victory by 34,920 votes over Republican nominee James Mitchell, who had been Secretary of Labor in Eisenhower administration, aided by Mitchell's limited campaigning after breaking leg. As governor, unsuccessfully sought to pass income tax, but in second term signed bill imposing three-cent sales tax. Succeeded in having Atlantic City selected as site of 1964 Democratic National Convention, but deterioration of hotels and other City amenities generated adverse coverage in national media. Re-elected in 1965 over state Senator Wayne Dumont in campaign dominated by controversy over comments by Rutgers professor that he would "welcome" victory by North Vietnamese in Vietnam War, with Hughes deploring comment but defending academic freedom in rejecting Dumont call for professor's firing. In June 1967, hosted summit meeting between President Lyndon Johnson and Soviet Premier Alexi Kosygin at Glassboro State College (now Rowan University). In following month, July 1967, oversaw state response, including mobilizing National Guard, to riots in Newark which over six days left 26 dead and hundreds injured, highlighted racial tensions in city and nation. In 1968, one of three final candidates considered by Vice President and Presidential nominee Hubert Humphrey as Democratic nominee for Vice President, with Humphrey ultimately selecting Senator Edmund Muskie of Maine. After leaving office, returned to private practice with office in Trenton. Named as chief justice in November 1973 by Republican successor and outgoing governor, William Cahill, after unexpected death of Pierre Garven only weeks after appointment by Cahill. Died in Florida at age 83, interred at St. Mary's Cemetery in Trenton. Son Brian Hughes serves as Mercer County Executive; stepson Michael Murphy finished third in 1997 Democratic gubernatorial primary. Richard J. Hughes Justice Complex in Trenton houses state Supreme Court, administrative offices of judiciary and Department of Law and Public Safety headed by Attorney General. 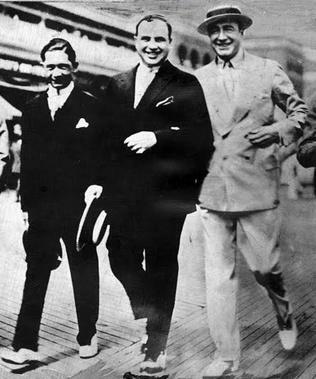 Johnson (right), Al Capone (center) and Meyer Lansky on Atlantic City boardwalk during conference of national crime leaders in 1929. Political boss and racketeer who ran Republican machine controlling Atlantic City and Atlantic County from 1911 until end of 1930s. Life provoked renewed interest following publication of nonfiction book Boardwalk Empire in and subsequent Home Box office television series of same name which ran for five seasons beginning in September 2010 presenting somewhat fictionalized account (and changing central character's last name to Thompson) adapted from book. Born in Smithville, graduated from Atlantic City High School in 1900. Father Atlantic County sheriff in Republican organization headed by Louis Kuehnle, in 1905 appointed son Nucky as undersheriff and in 1908 election succeeded father as sheriff. Elected secretary of Atlantic County Republican Executive Committee in 1909, also had positions as treasurer of Atlantic County. In 1911, after massive vote fraud by County Republicans in unsuccessful effort to defeat Woodrow Wilson in gubernatorial election, new Wilson administration initiated investigations which ultimately led to conviction of Kuehnle on corruption charges, with Johnson succeeding him as boss. Flamboyant lifestyle included living in palatial suite at Atlantic City hotel; wearing red carnation in lapel; owning four new chauffeur-driven Cadillacs; and escorting series of beautiful women. Maintained control of City and County through kickbacks on public contracts and employment, as well as payments from illegal casinos, prostitution, taverns and bootleggers during Prohibition. Famously quoted saying "We have whisky, wine, women, song and slot machines. I won't deny it and I won't apologize for it. If the majority of the people didn't want them they wouldn't be profitable and they would not exist. The fact that they do exist proves to me that the people want them." Also built popularity through assisting poor with food, jobs and money, and contributions to churches, variety of local causes. In 1929, hosted "Atlantic City Conference" of national crime leaders including Al Capone, Meyer Lansky, Lucky Luciano and others, reportedly to chastise Capone for highly-publicized St. Valentine's Day Massacre earlier in year and to plan for replacing revenues expected to be lost with expected repeal of Prohibition. After early conflict with local businessman and publisher Walter Edge, supported Edge's later political career, including 1916 election as governor, a victory reportedly secured through deal between Johnson and Hudson County Democratic boss Frank Hague. In May 1939, after lengthy federal investigation provoked by series of articles focusing on corruption in newspapers published by William Randolph Hearst (a purported rival for affections of a showgirl), indicted for income tax evasion, convicted in July 1941 and sentenced to 10 years in prison, released after serving four years in August 1945. Married twice, first in 1906 to Mabel Jeffries, who died in 1913 of consumption. On day before sentencing for tax evasion in 1941, married Florence "Flossie" Osbeck, former showgirl 25 years his junior. Died in nursing home, buried in Little Egg Harbor Township. Born in Englewood, father Dwight W. Morrow a partner in Wall Street banking house of J.P. Morgan & Co. and one of wealthiest New Jersey residents, ambassador to Mexico 1927-1930, elected as Republican senator from New Jersey in 1930, but died after serving only nine months in office. Mother, Elizabeth Reeve Cutter Morrow, poet and teacher who later served as acting president of Smith College in 1939 and 1940. Graduated in 1928 from Smith College, won awards for her writing. In December 1927, during Christmas holidays while still a 21-year-old senior at Smith, met Charles Lindbergh in Mexico City as father hosted him as US ambassador during Lindbergh's stop on world tour following triumphant solo trans-Atlantic flight on his plane 'The Spirit of Saint Louis' in previous May. 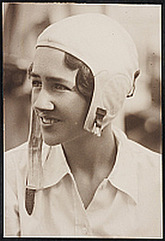 Became accomplished pilot and navigator on her own, with only one day of instruction, became first woman in country to receive a glider pilot’s license. Married Lindbergh in 1929 wedding held at Morrow home in Englewood. Couple moved to home in East Amwell Township in Hunterdon County west of Princeton. A few months before her first child, Charles Augustus, Jr., was born on June 30, 1930, served as navigator on initial coast-to-coast flight with husband which broke transcontinental speed record. 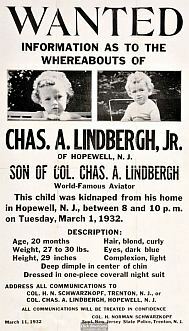 On March 1, 1932, 20-month-old Charles Jr. kidnapped from second-floor bedroom of family home, with ransom note left on window sill. Along with Norman Schwarzkopf, superintendent of New Jersey State Police, Charles actively participated in efforts to locate infant and kidnappers, including traveling to sites identified as ransom drops. Ten weeks later, infant's body found in woods in Hopewell Township north of Trenton. In September 1934, police arrested Bruno Richard Hauptmann, a carpenter who lived in the Bronx and charged him with baby's murder. After a highly-publicized trial of "Crime of the Century" at Hunterdon County Court House in Flemington prosecuted by New Jersey Attorney General David Wilentz, Hauptmann was convicted and executed on April 3, 1936 in electric chair at Trenton State Prison. In 1935, after Hauptmann's trial, Lindberghs and their 3-year-old son Jon moved to Europe for privacy and safety. While in Europe, husband's popularity declined as result of his praise of German military and advocacy of US neutrality. Her book The Wave of the Future published in 1940 also sharply criticized for positive comments about Hitler, implication that expansion by totalitarian governments could not be restrained. Author of over two dozen works of prose and poetry, her first book, North to the Orient, account of aerial trip with husband on the Great Circle Route, became bestseller in 1935. Gift from the Sea published in 1955, personal meditation on lives of women, on New York Times bestseller list for 80 weeks, including 47 weeks at No. 1, sold five million copies in hardcover and paperback during its first 20 years in print. Died at age 94 at home in Vermont. Famous aviator, made first solo nonstop trans-Atlantic flight on May 20-21, 1927, in contest to win $25,000 prize for first solo flight. Greeted with celebrations in Europe and US, dubbed by press as "Lucky Lindy" and "Lone Eagle," awards included Congressional Medal of Honor and Distinguished Flying Cross. After return, embarked on US and world tour, in December 1927 met Anne Morrow, daughter of US ambassador to Mexico Dwight Morrow who was his host in Mexico City. Two years later, married her at Morrow family home in Englewood. After couple moved to home in East Amwell Township in Hunterdon County, first child, 20-month old Charles Jr., kidnapped from second-floor bedroom, with a ransom note left on window sill. Along with Norman Schwarzkopf, superintendent of New Jersey State Police, personally participated in efforts to locate infant and kidnappers, including traveling to sites identified as ransom drops. Ten weeks later, infant's body found in woods in Hopewell Township north of Trenton, about four miles from Lindbergh home. In September 1934, police arrested Bruno Richard Hauptmann, a carpenter who lived in the Bronx and charged him with baby's murder. After highly-publicized trial of "Crime of the Century" at Hunterdon County Court House in Flemington prosecuted by New Jersey Attorney General David Wilentz, Hauptmann convicted, later executed on April 3, 1936 in electric chair at Trenton State Prison. Lindbergh kidnapping led Congress to pass "Lindbergh law," making kidnapping federal offense if victim is taken across state lines or if mail used for ransom demands. While in Europe, Lindbergh honored by various governments, including that of Nazi Germany, and quoted as praising Nazi military achievements. Upon return to US, also spoke at rallies of America First organization supporting US neutrality and opposing entry into war. Resigned commission in Army Air Corps after President Roosevelt publicly denounced him. Following attack on Pearl Harbor in December 1941, attempted to re-join military, but rejected due to previous opposition to war. Despite civilian status, became adviser to Air Force in Pacific war, flew 50 combat missions. Subsequently avoided publicity, but in 1950s worked as consultant to US Air Force and President Eisenhower restored commission, appointing him in 1954 a brigadier general in Air Force. Also hired by airlines and aircraft builders as consultant, helped design Boeing 747. In 1953, published The Spirit of St. Louis, expanded account of 1927 transatlantic flight, which won 1954 Pulitzer Prize. Advocate in 1960s for protection of natural resources and endangered species until death from cancer at his home on Hawaiian island of Maui.. Born in Detroit, grew up on farm in Minnesota, father a US congressman from Minnesota 1907 to 1917. Enrolled at University of Wisconsin to study engineering, but dropped out after two years to become a pilot. In 1924, enlisted in US Army to train as an Army Air Service Reserve pilot. After completing Army training, the hired by aircraft firm to fly mail between St. Louis and Chicago. Subsequently persuaded St. Louis businessmen to help finance cost of plane to win prize for first solo transatlantic flight, to recognize support named plane "Spirit of St. Louis." Major General during Civil War, removed by Lincoln from command of Army of the Potomac in late 1862 over failure to aggressively assault Confederate forces. Ran unsuccessfully against Lincoln's re-election as Democratic presidential nominee in 1864. Elected 1887 as governor of New Jersey, served single three-year term, left office in 1881. Born into wealthy Philadelphia family, entered military service at age 15, accepted to West Point despite being under minimum age requirement of 16, ranked second in class upon graduation in 1846. Left military in 1857, became chief engineer of newly constructed Illinois Central Railroad and in 1860 named president of Ohio and Mississippi River Railroad based in Cincinnati. Rejoined army after outbreak of war, organized Army of the Potomac in 1861. In 1862, McClellan’s Peninsula Campaign against Richmond was repulsed, later that year also failed to win victory against Robert E. Lee’s forces at Battle of Antietam. Frustrated by McClellan’s overly cautious tactics in keeping his troops on outskirts of Washington, Lincoln was famously quoted "if General McClellan does not want to use the army, I would like to borrow it, provided I can see how it can be made to do something." On November 5, 1862, President removed him from command of Army of the Potomac, soon naming General Ambrose Burnside as commander. Democratic presidential candidate in 1864 opposing Lincoln's re-election, but lost when party factions split over whether to continue war. After several years in Europe, returned to railroad business in 1872 as president of Atlantic and Great Western Railroad. In 1877, elected governor of New Jersey, focused in restoring economy after Panic of 1873, successfully called for repeal of direct taxes; creation of bureau labor and industry; founded schools focused on industrial training; and establishment of agricultural experiment station to aid farmers. Also restructured and modernized state militia. Considered campaign for presidency in 1880, but withdrew due to lack of support. Left office in 1881. During tenure, restructured state militia restructured; founded schools focused on industrial training; and a established special tax commission. Died at age 58, buried in Riverview Cemetery in Trenton. Born in New York City to William Edwards and Eleanor Bumstead Stevenson, both parents high Red Cross officials during World War II, awarded Bronze Star medal by US government. Father a 1922 Princeton University graduate, Rhodes Scholar and Olympic gold-medalist in track and field. Served as president of Oberlin College (1946-1961), US ambassador to Philippines (1962-1965). His father, J. Ross Stevenson, president of Princeton Theological Seminary 1914-1936. Helen graduated from Colorado College in Colorado Springs in 1950; served 1950-1952 with American troops in Korea and Japan as field worker for Red Cross; guide at United Nations in New York City 1952-1953; Trans World Airlines national consumer advisor 1953-1955. Resigned TWA position 1955 to work full-time on 1956 Democratic presidential campaign staff of distant cousin, Adlai Stevenson. Met future husband, Governor Robert Meyner, in 1955 when he gave keynote speech at mock convention at Oberlin College headed by her father. Married in January 1957, first to reside at Morven, historic colonial home newly renovated to serve as official governor’s mansion in Princeton. After husband left office in 1962, wrote column for Newark Star-Ledger and hosted local television interview program from 1965 to 1968. Husband defeated in 1969 election in attempt to return as governor by Republican William Cahill. In 1973, encouraged by leading Democrats to run as replacement candidate for Congress in primarily Republican Hunterdon County district against Republican Joseph Maraziti, lost first election but won in 1975, re-elected in 1977 before loss in 1979 to James Courter. While in Congress, successfully opposed construction of Tocks Island Dam on Delaware River and efforts by Department of Defense to close Picatinny Arsenal. After leaving Congress, served as member of state rehabilitation commission and on corporate and nonprofit boards, including Prudential, Allied Chemical, Rider College, New Jersey Symphony Orchestra and Newark Museum. Following husband's death in 1990, moved to Florida. Buried next to husband in Phillipsburg Cemetery. In 1994, Lafayette College established Robert B. and Helen S. Meyner Center for the Study of State and Local Government. Elected Governor in 1953 upset aided by split among Republicans, first Democrat elected to statewide office since 1940. Re-elected in 1957, launched favorite-son presidential campaign in 1960 for nomination won by John F. Kennedy, but refusal to release state delegates at national convention to allow vote for Kennedy provoked resentment by delegates and Kennedy insiders. Defeated in 1969 comeback bid for governor by Republican William T. Cahill. Prior to 1953 election, served only one term as state Senator from Hunterdon County, but selected by Democratic bosses as compromise candidate in likely losing race. Elected over Republican building contractor Paul Troast by 150,000 votes after disclosure that Troast had written to New York Governor Thomas E. Dewey urging clemency for a notorious labor racketeer then imprisoned in New York. Bachelor when elected to first term, married Helen Stevenson in January 1957, first to reside at Morven, historic colonial home newly renovated to serve as official governor’s mansion in Princeton. As governor, advanced fiscally conservative legislative agenda through heavily Republican legislature. Appointed his counsel, Joseph Weintraub, as associate justice and then chief justice of state Supreme Court. Brendan Byrne named executive secretary to governor after first being hired by Weintraub as an assistant counsel, later appointed by Meyner as Essex County prosecutor. In 1954 , suspended Harold Hoffman, director of State Division of Employment Security and former governor in 1930s, after discovering accounting conflicts, confession by Hoffman revealed after death admitted embezzlement of $300,000 in state funds. Born in Easton, Pennsylvania., father worked as repairman on textile looms. After family moved to Phillipsburg, attended public schools while also working as newsboy, grocery clerk and silk weaver. Graduated from Lafayette College and Columbia University Law School in 1933. Practiced law in Phillipsburg and served as a naval officer in World War II. Bachelor when elected in 1953 at age 45 as governor, married in 1957 Helen Stevenson, who served in House of Representatives from 1975 to 1979. Suffered stroke in 1986, died at age 91 at Florida home, buried in Phillipsburg Cemetery. In 1994, Lafayette College established Robert B. and Helen S. Meyner Center for the Study of State and Local Government.